American Cancer Society. Multiple myeloma: what are the key statistics about multiple myeloma? Revised January 19, 2016. www.cancer.org/cancer/multiplemye loma/detailedguide/multiple-myeloma-key-statistics. Accessed December 8, 2015. Smith L, McCourt O, Henrich M, et al. Multiple myeloma and physical activity: a scoping review. BMJ Open. 2015;5:e009576. Erratum in: BMJ Open. 2016; 6:e009576corr1. Mayo Clinic staff. Diseases and conditions: multiple myeloma: treatments and drugs. December 4, 2015. www.mayoclinic.org/diseases-conditions/multiple-myeloma/basics/treatment/con-20026607. Accessed December 15, 2015. Andrews SW, Kabrah S, May JE, et al. Multiple mye­loma: the bone marrow microenvironment and its relation to treatment. Br J Biomed Sci. 2013;70:110-120. Bristol-Myers Squibb. New longer-term data for Empliciti (elotuzumab) showed a continued progression-free survival benefit in patients with relapsed or refractory multiple myeloma. Press release. 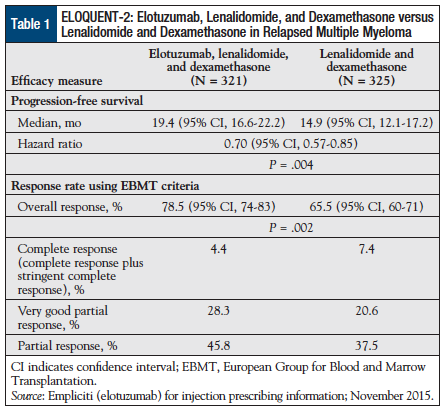 December 5, 2015. http://news.bms.com/press-release/new-longer-term-data-empliciti-elotuzumab-showed-continued-progression-free-survival-b. Accessed December 19, 2015. ClinicalTrials.gov. 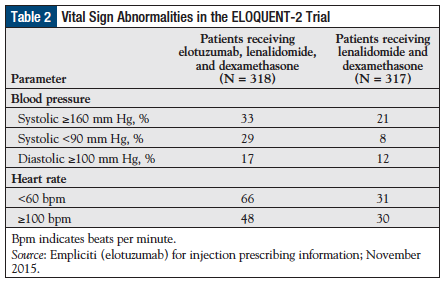 Elotuzumab. Search results. https://clinicaltrials.gov/ct2/results?term=Elotuzumab &Search=Search. Accessed February 16, 2016.